Our 2oz shot glasses are ideal for making the best tasting coffee by allowing you to get the perfect amount of flavored syrup or espresso. 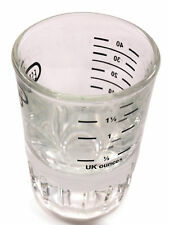 These shot glasses have a overall capacity of 2oz but are lined at 0.5oz, 1oz and 1.5oz allowing for the perfect blend. Perfect for use at parties, the traditional design and silver screw lids are a sure way to impress your friends and family. The perfect way of serving your favourite spirits. Lids are handwash only. Good retro set of 5 gilded crystal glass SHOT / SHERRY / VODKA / PORT GLASSES. About 60 ml capacity. Each glass is about 11 cm high. Condition: Very good barely used. A SET OF SIX 'TOASTING' SHOT GLASSES WITH DEEP BASES. THEY ARE 4" (10.5 CMS)TALL AND THE BASE IS 2" (6.5 cms) DEEP APPROX. IN EXCELLENT ORDER A GOOD SET. Vintage Scooner Sherry Glasses. Condition is Used. Dispatched with Royal Mail 2nd Class. Set of 6 Vintage Shot Glasses Decorated, Painted with Fruit and Flowers. Clear Glass with Gold Rim and a Vibrant Pattern of Fruit, Leaves & Flowers. Purple galss stem, etched glass floral design. KERNOW FURNITURE LTD.
Retro boxed shot glasses. KERNOW FURNITURE LTD.
6 lovely little liquor, shot or spirit drinking glasses. They are approx. 6cms tall & 4cms across. They are clear glass with 2 bands of red. 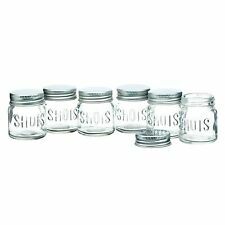 Mason Jar Shot Glasses. Height approx 8.5cm. Made of GOOD QUALITY crystal glass. SET OF SIX. CLASSIC SHAPE AND SIZE. 5 are red and 1 is orange. Retro set of 6 shot glasses each in a different colour with lustre finish, manufacturer unknown 5 cm (2 inches) diameter, 6 cm (2 1/4 inches) tall. Vintage set of 4 cut crystal glass CORDIAL / SHOT / SHERRY / LIQUOR GLASSES. Condition: Good used. Minimal signs of wear. There is a tiniest dot size not sharp chip on the edge of one glass - last photo. Good quality cut crystal glass - has a nice ring to it. I have lots of beautiful things for sale. Set of 6 Luminarc Stemmed Shot glasses. No chips or cracks. Some labels have come off in use. Have 3 matching wine glasses on a seperate listing. Vintage Retro Shot Glasses X6 Kingfisher Design with guilted lip on glass 7cm high. Bowl is 4.5 Lovely condition. Grape Design. They may have. A Truly Delightful Retro Sherry/ Port/ Shot/ Wine Glasses Set, Which Would Look Great At That Special Occasion Table Setting. Each Glass Features A Different Vibrantly Coloured, Ripe & Mouth-Watering Transfer Fruit Motif With Thick/ Solid Base & Gold Edge Trim. 3D Skull Shaped. Set of Four Glasses. Add to Favourites. In Attractive Gift Box. A SUPERB QUALITY ITEM THAT WILL MAKE A PERFECT UNUSUAL GIFT. New stuff! We provide alternative clothing and accessories available at a fraction of the rrp. IN EXCELLENT CONDITION, NO BOX. Features a Retro Abstract Design with gold gilt edging - standard size. A lovely set of four glasses, square shaped, thick bottom. 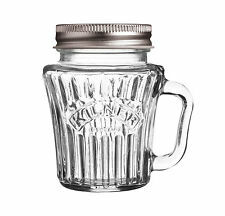 With tight-fitting screw-on lids, they look just like tiny versions of classic canning jars - fun for garden parties, dinners and more. BarCraft Mini Jar Shot Glasses With Lids. 6 Cocktail Shot Recipes included. A nice set of 6 shot glasses,with cars pictured on the front. 11 sherry glasses. 5 large wine glasses. 4 small wine glasses. Hand painted on. Glasses in very good condition, pattern intact on each glass, mostly been on display. Condition: been used. Good quality cut crystal glass, heavy and has a beautiful ring to it. I have lots of beautiful things for sale. Each glass is about 10.5 cm / 4.25" high. Set Of 5 Fox Hunting Scene Shot Glasses With Gold Banding around Rim France. Each has different scene. Marked to bases 'Luminarc, France'. The box has plenty of marks / shelf wear. Set Of 6 Vintage Shot Glasses With Old Fashion Car Motifs. Made In France.